I didn’t get to see that many games yesterday (although I did enjoy the mostly white-clad Ducks taking the BFBS Huskies behind the woodshed), and I caught most of ‘bama and Kentucky. But Terry Duroncelet, our SMUW guru did and here he is with the rundown from Week 7. • Cincinnati wore mono-red against Temple. I’ll be honest, out of all of the higher-tier Adidas teams in college football, Cincy seems to be one of the very few teams in which it actually works. But what I really liked about this game were the new helmets that Temple was wearing: matte helmets with ‘T’ on one side and the Liberty Bell on the other (super-HUGE thanks to Patrick Reynell for that Instagram link!) PLEASE. MAKE THOSE THE FULL-TIME HELMETS. O.K., maybe not full-time, but damn, those look fantastic. Really digged the velvet look these particular matte helmets had in a night game situation. One thing that I forgot to mention from last week is that the Bearcats wore ’77’ decals on their helmets in honor of fallen player Ben Flick, who died in a car accident three weeks ago (no photos, unfortunately). 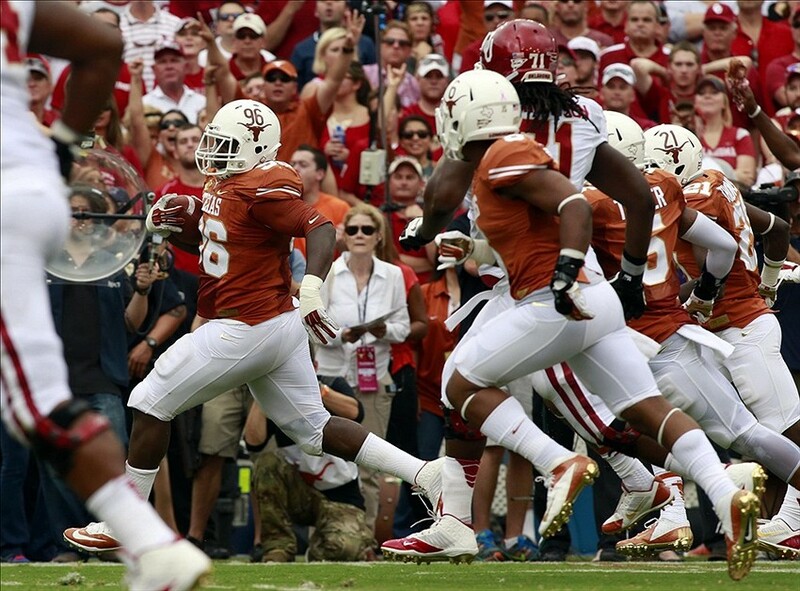 • This year’s Red River Rivalry looked rather… golden this year. I love this. All of this. Gold trim almost always seems to add a nice sense of warmth without going overboard, and these are no exception (that also gives you a good look at the jocktag on *I think* #32). From what I heard, this will be a thing for next season as well, with the designations swapped (Texas in all-white with gold trim, and Oklahoma in crimson-over-cream with gold trim). A Texas player had some slight damage to his helmet number decal (credit to Chris Perrenot for that pic). 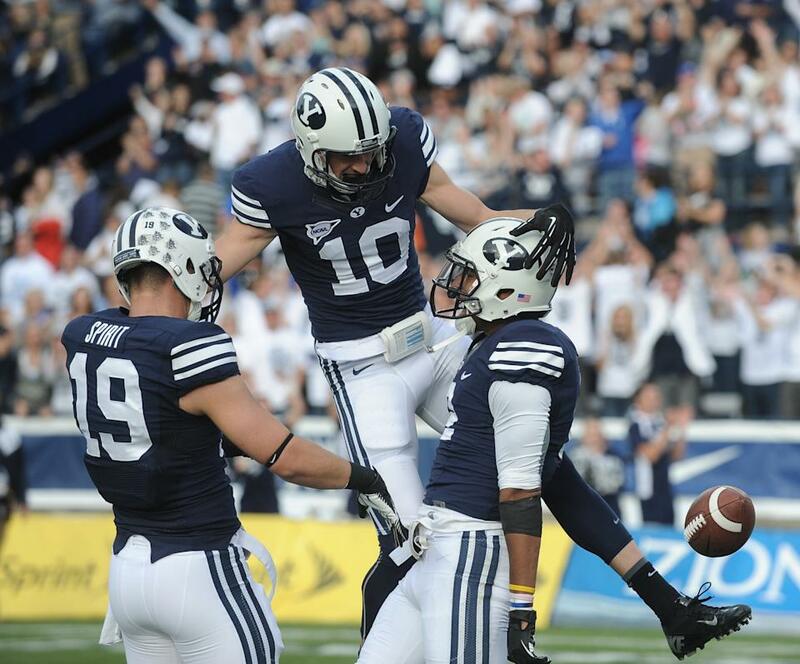 • BYU wore their ‘“Tradition”, “Spirit”, and “Honor”‘ jerseys on Saturday for Homecoming. 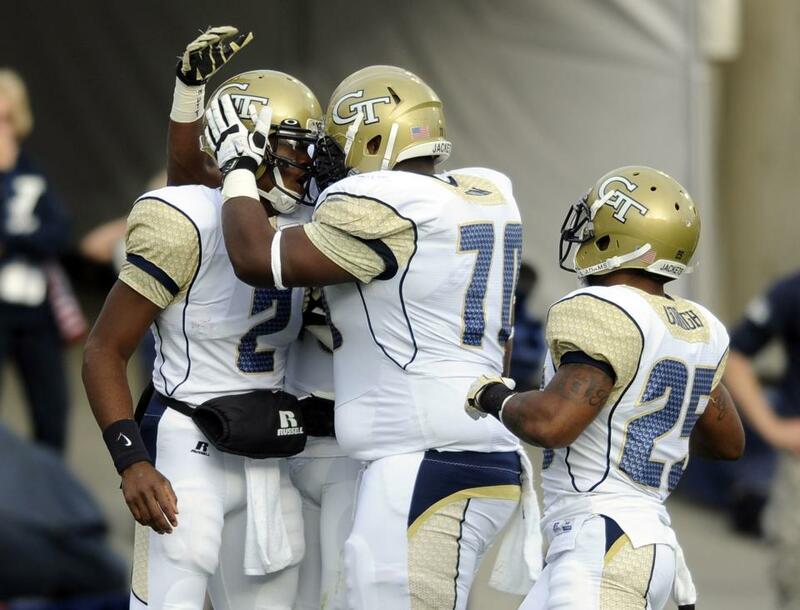 As for Georgia Tech… ugh, weren’t our eyes punished enough last year with this uniform costume? A better question to ask would be why did they wear last year’s uni? • See those little orange decals on the back of Virginia Tech’s helmets? Those are graduation decals, for their graduating student-athletes. Thank Alan C. for the pic. 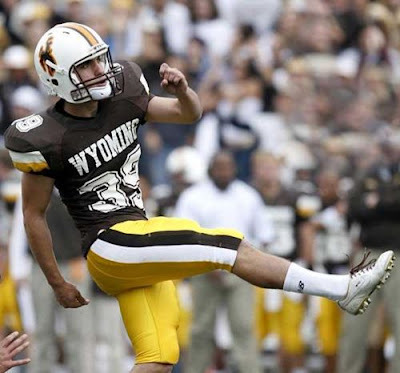 • Wyoming’s unbalanced look of white helmets, brown jerseys, and yellow pants is a bad look. Like, a really bad look. But hey, it can’t get any worse than that, right? Right? How many days until November? That was worn against New Mexico, BTW. • Arizona State wore their USC uniforms against Colorado. Not bad. • Washington never looks good in BFBS. Ever. But at least they have matching helmets this year, so think of this costume as a piece of moldy bread that doesn’t have as much mold this year compared to a piece of moldy bread from last year, or the year before that. Speaking of the helmets, the stripes were coming off of some of them, as Mike Lindquist writes “Looks like a Washington player was hit so hard, the stripes on his helmet started to come off near the ends. This one was the most noticeable one as a couple other players had smaller issues.”. • Eastern Michigan wore these sweet helmets against Army. • From the Kansas St./Baylor game, Chris Perrenot writes: “Not one, but TWO helmet placentas on the Kansas State sideline. Gross!” Uhh… thank you for the catch… I guess. • You know those red sideline caps that the Quarterbacks wear sometimes while they have their headsets on? The Oregon QBs have their uniform numbers on them. 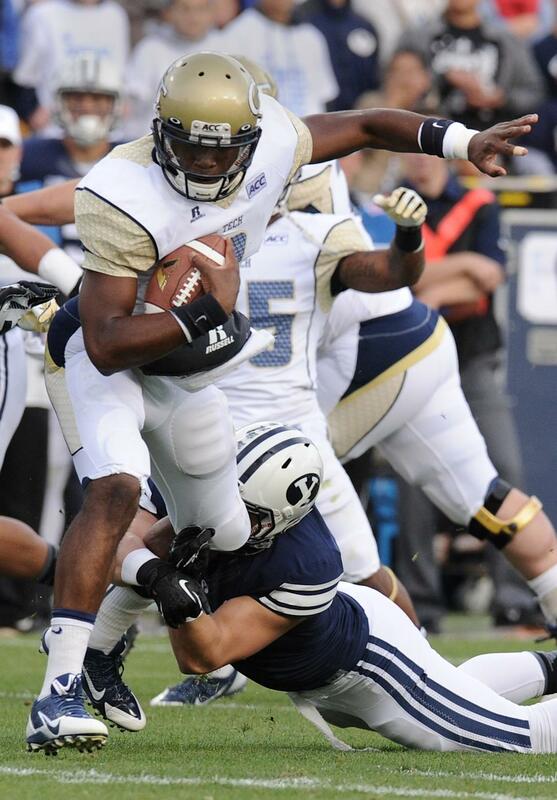 • Utah State wore white at home against Boise State. • Color-vs.-color game between Ohio and Central Michigan. Credit to Timothy Welsh for that pic. • Something that I didn’t realize: LSU QB Zach Mettenberger’s knee brace has the LSU wordmark on it. • Something that Andrew Lopez sent in: “Due to many complaints about the hard to see green on gray – Tulane has switched to white numbers.” I pitched this as one of my recommendations for this uniform during Week 1, but said that the number colors should be reversed: light-blue numbers with green trim. But this is a nice alternative. • Larry Manring sends this in: “Northern Colorado has some of the worst pants I’ve ever seen.” Hard to argue, unless we’re talking Southern Miss. • The Bruins/Bears game looked alright, minus UCLA’s Laffy Taffy suits, but I’ve already ragged on that enough times. Credit to Anon for that jersey pic, BTW. But the highlight of the game was seeing these two awesome old-timers wearing equally awesome — if not awesomer — sweaters! I’ll take eight! And from that game, a commercial came on involving Ray Lewis. Uhh… yeah, not the best thing to take out of context. That puts Week 7 in the books. See you all next week. Thanks, TJ! Nice roundup once again. We’ll see you for Week 8! Five and One Happy Sunday, UniWatchers! This weekend was a gorgeous one (at least here in New York City) and I spent it inside watching college football. It was pretty much an ideal weekend for me! Let’s get to the countdown! 5. Michigan vs. Penn State: I usually don’t like to let the actual game influence my choice but boy, this was a barn burner! This game was just simple and classic. Loved it! 4. Baylor vs. Kansas State: I watched this game for about an hour and a half before I really realized how much I liked it. I loved the Bears in the gold lids and K-State is about the only purple team (except for LSU) that I can tolerate. 3. Oklahoma vs. Texas: Everyone loves the Red River Rivalry and watching UT give the Sooners their first loss of the season was awesome. 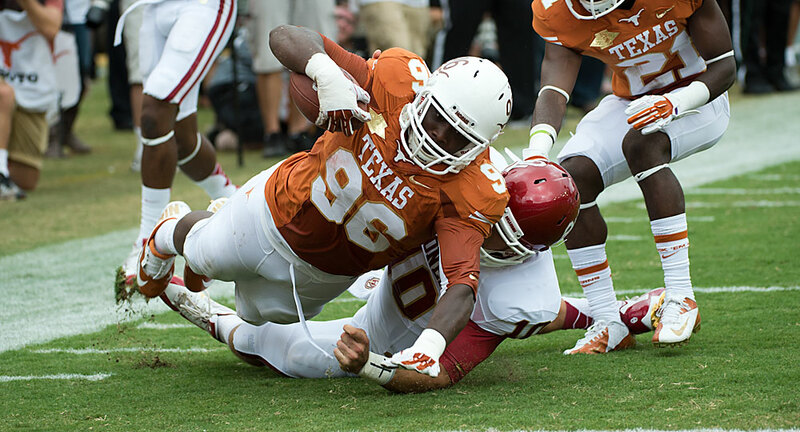 Texas always looks great in their home jerseys and Oklahoma (despite having 15 different logos on their jerseys) looked sharp in the all-whites. 2. South Carolina vs. Arkansas: One of the things I like to look for in a match-up is contrast between the two teams. Additionally, a little something is added when the “contrast” is the same two colors. This game had that little extra! The ‘backs got absolutely destroyed but they looked great during it. The Gamecocks wore their dark pants and the two teams offset each other nicely. 1. Florida vs. LSU: I was hoping Florida would wear their orange pants but, alas, I was disappointed. Regardless, the game still looked fantastic. +1 Oregon vs. Washington: I was looking forward to this game all week and I was disappointed. Oregon looked ridiculous and Washington went BFBS. The black-on-white made for a nice contrast but up close it just looked dumb. The Mallards of Eugene were at it again Saturday, this time going against another first time ever uni combination from debuted by the Seattle ‘Skies. While Washington’s new duds were a sight to behold, the Ducks wore but a variation of their week two road combo. Winning in comfortable fashion, the Ducks have been somewhat of a bore this season in both play and uniform combinations. Even with two new helmets, a whiteout and a monochrome yella, one can’t help but feel like the Quackers need to chang things up a bit. , OfficialNUniTracker@gmail.com or OfficialHoosierTracker@gmail.com. Happy Tracking. Well, for baseball purists, it didn’t get much better than yesterday. The St. Louis Cardinals, in their alternate cream unis with “St. Louis” in script defeated the gray-clad Los Angeles Dodgers 1-0. The gray-clad Detroit Tigers defeated (and damn near no-hit) the white uniformed Boston Red Sox 1-0. That was the first time two LCS games have ever both been decided by 1-0 scores on the same day. If you’re a fan of offense or softball tops, this was not a day for you. But if you love classic, nail-biting baseball with great pitching…then you got your wish yesterday. Thanks to Alex for the update. He’ll be back next weekend with the progress of both series. Uni Watch News Ticker: Major uniform malfunction Friday night in the CFL (great grab by Kenny Ocker). … There were many clever signs at ESPN’s GameDay, and I’m pretty sure this one was shown (that looks like a “pre-show” pic), sent in by Chris Flinn. … Also on that GameDay show was recently canned Lane Kiffen, and you can see some of the more clever signs being held behind him (“Phil Knight Wears Jorts” was particularly, um…witty? ), screen grab by J Fletcher … Speaking of Oregon, according to this hed, “Oregon Has An Awesome Hype Video For Its Brand New Football Recruiting Website.” … More from Chris Flinn: Check out this awesome pattern on the Diamond Ranch Academy’s football field. … Following up on an item in yesterday’s ticker, Alberto Sanchez noticed Jay Cutler’s cleats from Thursday, but he believes it’s actually just the inside swoosh that it’s orange and the outside swoosh that it’s blue in both shoes. … Good shot of a 1998 game where Randall Cunningham’s nameplate is a bit too big to fit within his Vikings shoulder loops (nice grab by Matt Barnett. … Speaking of shoulder loops and old time photos, check out this one from 1956. According to submitter Dan McNamara, this “Shows the Villanova football bench during the 9/22/56 game against Bear Bryant’s Texas A&M team. Villanova wearing unique headware and sucking on sponges to beat the heat. No stupid ads on these sideline hats! I checked historical records and it was over 105 degrees on the field that day.” … College Hockey Jerseys, Pt. I: Here are the new home and road jerseys with very minor tweaks for the defending National Champions Yale; Pt. II: Gemini Athletic has released the first of 7 different jerseys Air Force will wear this season along with this note, “Air Force is to Gemini what Oregon is to Nike. 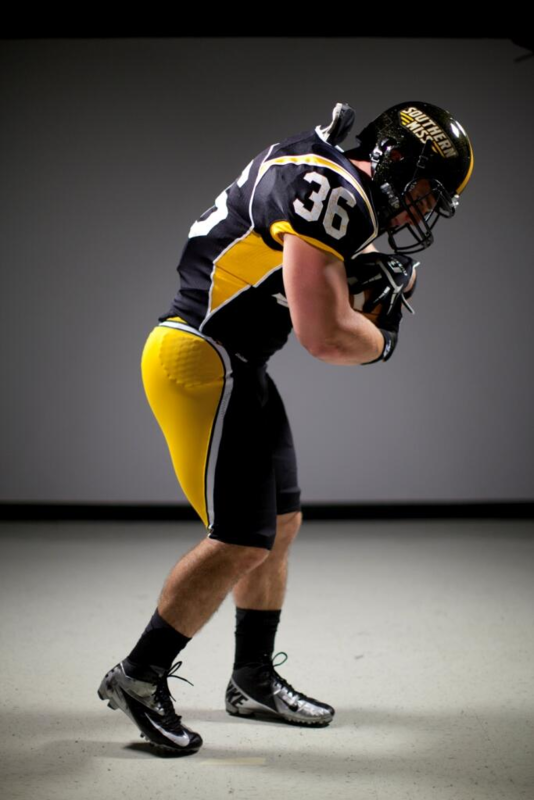 Here is a picture of one of the 7 sets of jerseys each player will have this season. The Bolt jersey will be debuting in Anchorage when the Falcons take on the Seawolves this Friday and Saturday.” (both of those thanks to Erik Sundermann). … Did you know there is a new city logo for Kansas City? Now you do (thanks, Matt Newbery). … Who Made That Android Logo? (from Brinke). That’s a wrap folks. I put this to bed (and myself) really late, and had a ton of Interwebs problems to boot, so you guys have a great Sunday and a better week. Thanks to everyone who contributed today. 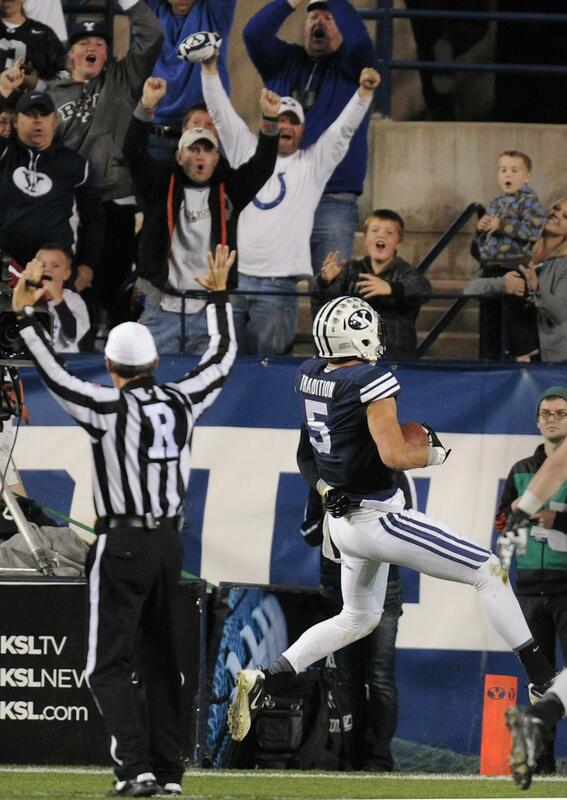 And don’t forget to find Jason Bernard and vote for him tomorrow during MNF. OK? OK!!! The Badgers from Wisconsin sported their alternate red helmets in their Homecoming victory over Northwestern yesterday. Those are kind of growing on me. I like those red helmets. What the hell is a ‘helmet placenta’?? I think he’s referring to the neck-pillow-thing just below the helmet on the player directly to the front-left of the coach, and the player closest to us on the right, but I have no idea what that actually is. The Jeff…I believe those are some kind of hair “baggie”. Both of those players have long hair and this is a way to keep it from hanging out and being grabbed by opponents. I’ve been assuming they hold the player’s hair. I think its just a K-State thing though since I haven’t noticed other teams using them. Speaking of BC-Clemson, how did that matchup not receive consideration for Catherine’s 5? Had BC worn gold pants, that would have been enough to take the top spot away from Florida-LSU? Love the MLB playoff uniform tracker, but noticed that the Cards and Pirates are both listed as having won game 3 of their series. Also, I hope the Pirates BFBS trend in the playoffs doesn’t continue permanently, as their white and grey unis are among my favorites. Cards/Dodgers yesterday was one of the better looking games you’ll ever see! Don’t know if the Pirates will be wearing the popular black jerseys exclusively for their next playoff run. With the demise of the yellow batting practice jersey, that opens up the possibility of using that style as a game jersey. Obviously, you would have to remove the black panels and add numbers to the front. Will they still be wearing black and gold in 2037? Yes, but it’ll be Vegas gold. 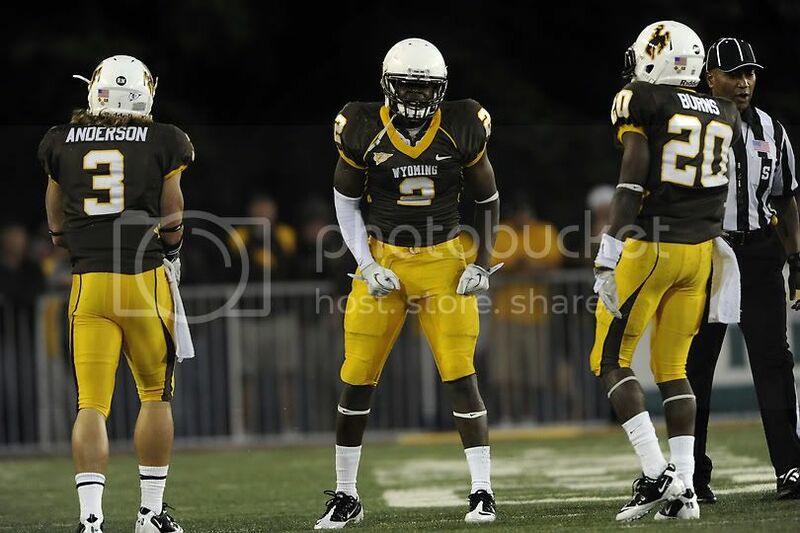 I don’t really think the Wyoming white helmet, brown jersey, and yellow pants is THAT bad. What do you want? White pants? White pants can be so boring sometimes. How about a brown or yellow helmet? Because the good guys wear white hats. The only thing wrong with WYO yesterday was the addition of the pink. Otherwise that’s a fine looking uniform. Kudos to Catherine for giving Oregon/Washington its due as the &1…and it’s nice to see Phil didn’t give her any grief over it. When that other 5&1 guy picked this matchup back in the day, he almost got run out of town. White helmets shouldn’t be worn over both a non-white jersey and non-white pants. It may not be terrible, but it just doesn’t work as well as the options that use a helmet that matches. I propose that Temple football stick with the matte finish and white facemask, dump the block T logo in favor of the arched school name AND put the Liberty Bell underneath that. No more snowy owl all-white, no more owl pellet black! surprisingly no mention or photo of the UW RB who had his nameplate flapping around during the game. there was a great slo-mo shot of Bishop Sankey scoring a TD and it was so obvious that Gus Johnson even made a corny broadcast joke about it. Also, in the Arizona State game, Colorado wore their Black helmets with gold Ralphie logo for only the 5th time in 3 years. They are now 0-5 in those games. I imagine you could choose many uniform elements that Colorado would be 0-5 in during that stretch. Absolutely true. But, CU is a robust 6-19 during that time period with the classic gold lids. Since Ohio State was off yesterday we decided to go see Youngstown State play Illinois State. YSU has since Tressel was there worn black pants with red jerseys. I wish they stuck with school colors or red and white. Anyhow this week I mentioned high school teams and the rarity of purple as school colors. I read a couple posters say their schools used purple. At least 2 schools in the Youngstown area wear Purple. Sebring and Champion high. The Champion band played at YSUs halftime. Still not many schools use purple. we started the red over black look when i was an equipment manager there (as you know) we wore all white on the road most of the time. our pants were from the all black unis that the penguins wore when trenton lykes was there vs murray state i believe. since ysu lost-tressel said they would have to “earn” the black unis back. never did. pants became game pants. jerseys became scout team jerseys. Thanks for that bit of background DStoops. I am glad you posted it. We walked through the Hall of Fame room before the game. Some cool old unis and helmets in there. I knew that YSUs old colors were red and gold. They had a white jersey with red and gold stripes. Also some neat red and gold sweaters. And surprisingly an old Notre Dame uniform from 40s. any time larry! i wonder if the notre dame uni was that of bob dove’s? he played atnotre dame and is coach emeritus at youngstown state being on tressel’s first few staffs when my dad got hired. my dad was also at youngstown state when rey dempsey was tere and cliffstoudt was the quarterback. we had some awesome old face masks and stuff in the back of our equipment room! everything talked about on this site i have either seen-fixed-touched etc. Speaking of high schools wearing purple, my high school (Waite, in Toledo OH) wore purple and gold (yellow on the sports team uniforms, metallic gold on t-shirts), and we were (and as far as I’m aware, still are) the Indians. Maybe I really am the Anti-Paul. And no ‘skins Watch, right Larry? I know how much you must miss that on the weekends. hahahaha ah yes Phil. And The Jeff had a good one too. 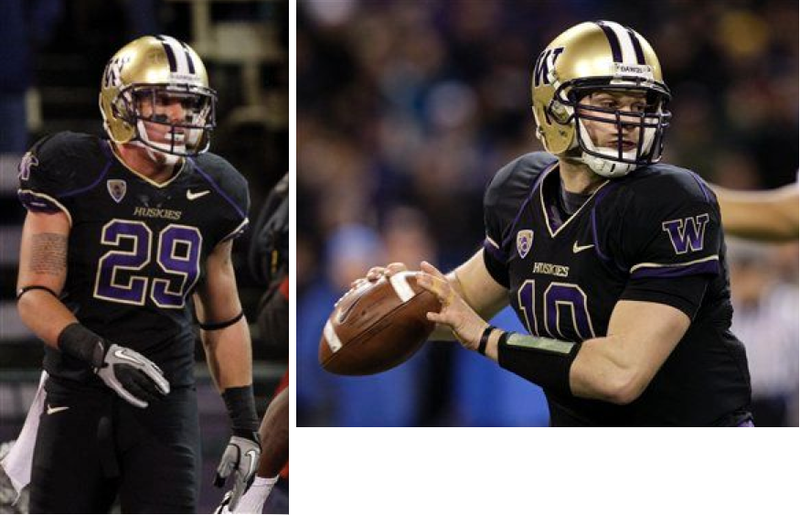 Speaking of purple, The Washington Huskies have a great look when they wear the purple and gold. I dont care for their use of black as much as they do. It is not a bad look but purple and gold Husky unis are sharp. Didn’t get a shot but one Northwestern player had some damage to his jersey, and had to come out of the game to get it replaced, and wound up wearing a different number with no nameplate. probably just thrown off by the use of the word “placenta”. at least you didn’t say “helmet scrotum”, but then maybe more people would have understood. here’s a better pic of what is being referred to (hair sack). I’ll use this space to point out that I can’t comment anymore from my usual address because my roommate is a spammer. So your roommate is Nike? I’m surprised nobody mentioned that Max Scherzer had “41-26” on the front of his hoodie while he chatted on the air with Joe Buck and Tim McCarver during yesterday’s game. Buck even commented on it, pointing out that it was the final score of the Missouri – Georgia game yesterday. No pic, but it appeared to be made of the same numbering decals the Tigers use on their batting helmets. I didn’t see it, but someone shot UW an e-mail mentioning it, but without a pic. Searched quickly for a photo and didn’t see one. Had there been a pic, it would have been tickerized, but my bad for forgetting to even mention it. Let me Google that for y’all. The Oklahoma-Texas game had me digging through The Google this afternoon. Am I stroking out or am I correct in remembering a time not long ago when Oklahoma had crimson pants? I swear I remember them wearing them on the road sometime around the 90’s or early 2000’s. I remember this because I hate the all white look and was thrilled to see them add the color but I can’t seem to find any pictures of this. Anybody remember this or when it may have been or is my lack of sleep finally catching up to me? Tom Brady just walked to the sidelines and handed the helmet he was wearing to an assistant, who in turn handed him a different helmet. Presumably this was a headset issue. While I understand the thought behind the “one helmet per season” rule, if one player can switch helmets between plays, it can’t be that hard for a team to switch helmets over the course of a week. With approximately eleven minutes left in the second quarter of the Saints vs. Patriots, the CBS telecast showed a clip in between plays of Tom Brady exchanging helmets at the sideline, presumably to swap out a malfunctioning speaker. (Sorry, no pic). In light of the recent rule about no alternate helmets, does anyone know if there is a special provision in the current rules for alternate helmets for those with the designated in-helmet speaker (and obligatory neon green dot). In a similar vein, do quarterbacks and defensive players that wear the special communicator (green dot) helmets practice with the same helmets during the week, or do they only wear the communicator helmets on game days? Washington looked fine on yesterday. That’s how you do black hats, shirts and britches. Count me in with Terry and Catherine on liking the look on the Texas/Oklahoma game. I was surprised to see a distinct lack of pink accessories throughout the Lions-Browns game… which is odd since they seemed to be in all the other games (especially Saints-Patriots). I’m monitoring Twitter for pics of the Mighty-once-more Ducks v. Senators going on right now. At the risk of nitpicking, it would have been so awesome if the Sens would have donned throwback sweaters for the occasion. But Anaheim is doing a fine job with Retro Night. Bob Costas just hit the ball out of the park regarding the Washington football team name (at halftime of the Sunday night game). Hopefully there will be a version available on YouTube soon. One error on his part: considering the Chicago Blackhawks alongside the Flotida State Seminoles and the Central Michigan Chippewas. The Blackhawks are NOT named after an American Indian nation, but (indirectly) after Black Hawk, a human being. I must confess, I didn’t know that until recently (thanks to this site). But, I agree, I think he would have done better sticking to the Washington issue. At first i thought maybe it was a dickey underneath the jersey but it doesn’t look to be so. 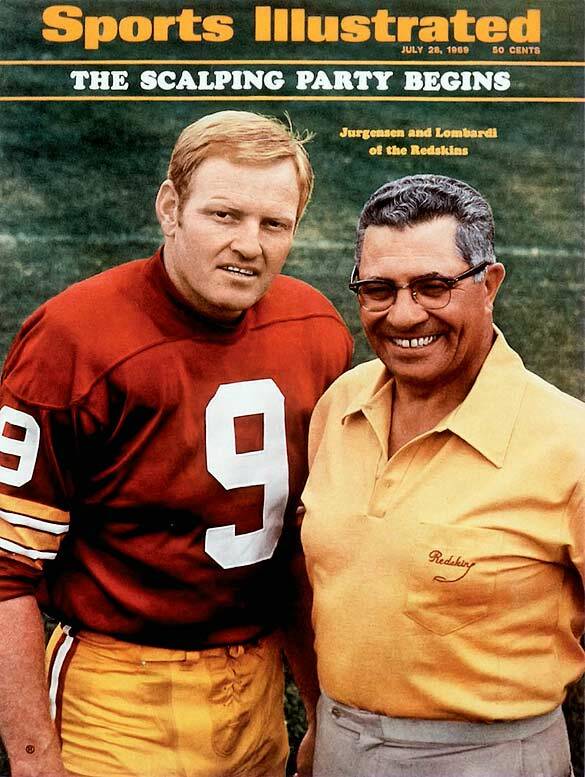 Sonny Jurgensen is wearing a mockturtlneck skins jersey did they ever wear this on the field? I haven’t found any photos of such. If not, why would such a jersey even exist? Have we ever addressed who designed the “classic” football helmet template? The ones that are displayed in the Cowboys and Redskins end zones? It seems that that template has been used forever, and I’ve always wondered who designed it. Nobody mentioned that Ole Miss wore navy blue pants Saturday PM vs. Texas A&M. This is the first time since before the John Vaught era that Ole Miss has worn something other than the traditional grey pants. I thought the entire navy blue helmet/jersey/pants combo looked great.